Blog :: Read Naturally's December Star of the Month is Melissa F. From Mount Kisco, NY :: Read Naturally, Inc.
A round of applause to Melissa F. for being named Read Naturally's December Star of the Month. 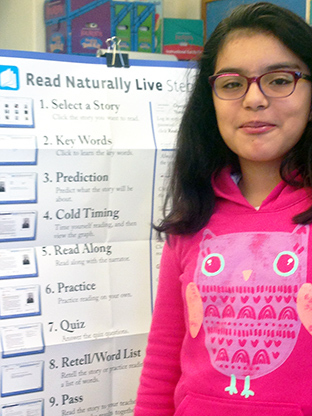 Melissa is a fifth-grade student at Mount Kisco Elementary in Mount Kisco, NY. Melissa was nominated by her teacher, Ms. Breeding, for her newfound confidence and continual efforts using Read Naturally Live. Ms. Breeding shared the below story of Melissa's success with us. Melissa has been receiving tier 2 reading support since 2nd grade. Last year, there were concerns about her progress and it was decided during an RTI meeting, that we should elevate her services to tier 3, and then put in a referral if she continued to show minimal growth in the fall. In September, I decided to place Melissa on Read Live. The other reading program I was currently using was not meeting her needs. I love the fluency, comprehension and phonics components to Read Live. I felt that this program would be more appropriate for her. I also like the comprehensible and detailed reports Read Live offers. I knew our special education department would find them helpful too, should I start the referral process. Two weeks ago, I was proud to present to the RTI team that Melissa had made huge gains. Her confidence and her interest in school has also increased. Because she is responding so well to Read Live and is on an upward trajectory for closing the gap, we decided not to move forward with the referral. I am so happy to be piloting this program in our school. Most of my students have shown amazing progress.